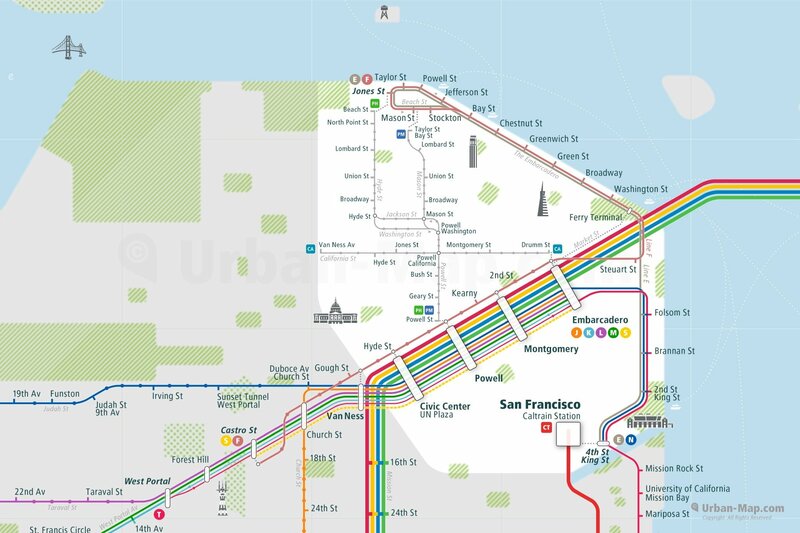 San Francisco Rail Map - A Smart City Guide Map, Even Offline! 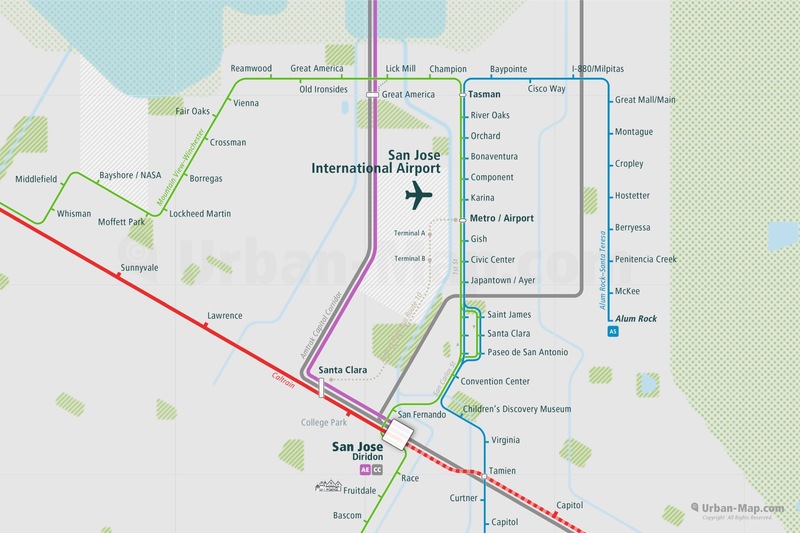 The San Francisco Rail Map is a train route city map that includes Cabel Car, Metro, BART Bay Area Rapid Transit and LRT San Jose and Airport Link in the public transport network of San Francisco and San Jose city area. Download the full San Francisco Rail Map on App Store & Google Play. 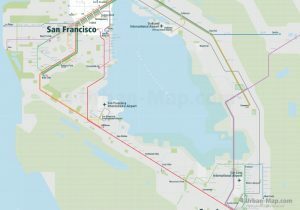 San Francisco Rail Map - Available now as a poster! 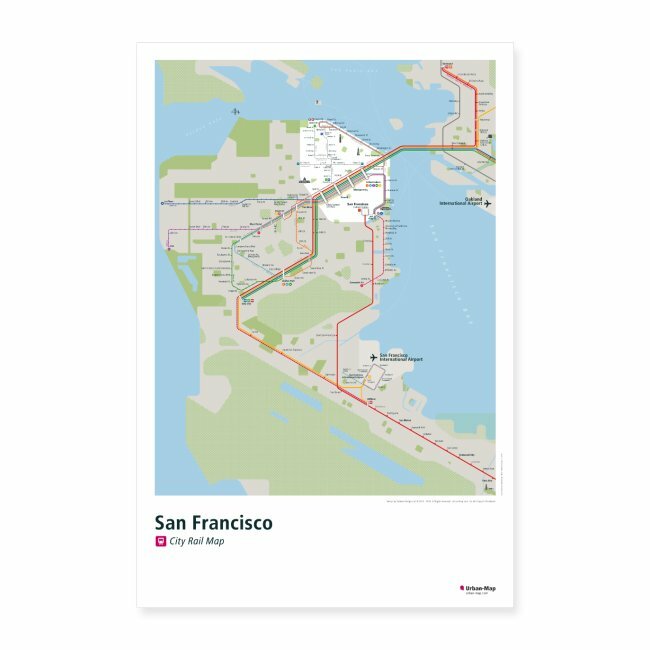 The poster of the San Francisco Rail Map is available in the Urban-Map online print shop worldwide. The Los Angeles Rail Map includes the public transportation system, as well as many major landmarks and points of interest. In addition to the maps, the City Rail Map app for mobile devices provides a route planner, the ability to search for all transport lines and station locations and connections, GPS support and many more features for your city trip. The handy › City Rail Map is therefore the ideal companion for traveling and getting around the city. includes Los Angeles and even more 60+ cities. 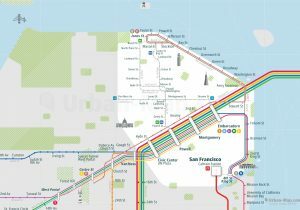 Let the San Francisco Rail Map show you the way where to go, where to stay and how to get there! San Francisco and the Bay Area, is a California metropolis consisting of nearly 8 million people and dozen cities like Oakland, San Jose, Santa Clara, Berkeley, Palo Alto, Mountain View, San Mateo, Richmond, Fremont, Hayward, Antioch, Santa Rosa, Sunnyvale, Vallejo among others . The city is located on a end of a hilly peninsula between the Pacific Ocean and the Bay of San Francisco. In the north is the famous Golden Gate Bridge and south leads to San Jose are the Silicon Valley which is surrounded by mountain ranges. The weather in winter has a mild to cool wet season and in summer most dry and sunny days, but San Francisco and the Golden Gate area are periodically affected by fog and an unseasonably cool ocean breeze. Your clothes should be casual to smart casual. A windbreaker is recommended even in summer and it should be noted that the weather is a bit unpredictable. The most common way to reach San Francisco is by airplane. The three international airports are San Francisco SFO, Oakland OAK and San Jose SJC. The San Francisco International Airport is the biggest airport. The airport is located in the south and can reach downtown by train in 30 minutes. San Francisco is well connected to › Los Angeles, › Seattle › Chicago, › New York, › Boston and international to › London, › Hong Kong, › Vancouver, › Taipei, › Seoul, › Frankfurt. 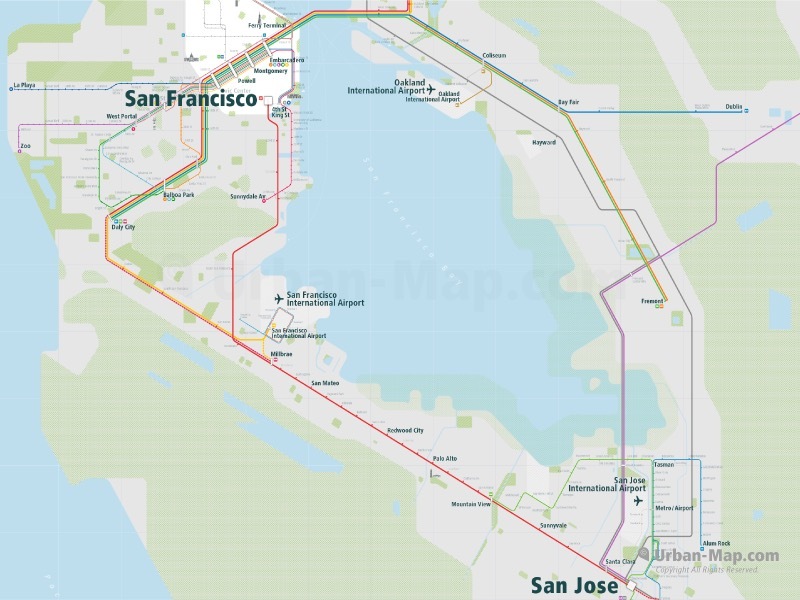 In San Francisco and around the bay area is a well connected network for commuter and intercity trains from San Francisco to San Jose and Oakland. Metro and light rail are available too. By metro and commuter train like BART, you easily reach most travel destinations within the Bay Area. Northern from Market Street are the nostalgic cabel cars. The trains and metro provides a cable car and public transport system runs from early morning to midnight. Taxis you can find next to the station and to pay by credit card is common. You should give 10% tip on top of the taxi fare. The best places to stay for business are clustered near Union Square and the Financial District. For vacation and family activities the hotels near Fisherman’s Wharf may be a better choice. For hiking and outdoor activities, you can find good places along the beaches where you will get views of the Golden Gate Bridge. Nice cafes, bars and small restaurants are dotted throughout San Francisco in every neighborhood. Some famous foods to try are a burrito in the Mission District, a New England Clam Chowder soup in a sourdough bread bowl at Fisherman’s Wharf and for dessert some Ghiardelli chocolate in the north of the city. For dancing and nightlife Union Square area and south of Market Street are the places to go. Some popular places to visit are the Golden Gate Bridge, Pier 39, Ferry Building Marketplace, Alcatraz Island, and the Cable Car Museum. English is the common language. The people of the city call San Francisco “S.F., Fog City or Golden Gate City”. 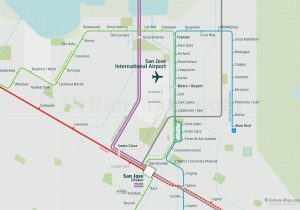 Below you can get a glimpse of the San Francisco & San Jose Rail Map. The full version of the map, including all main transportation routes and lines on rail and partly also bus and ferry. Special clearly marked stations, transfer hubs and interchanges for line transfer, as well as station names and landmarks represented. The San Francisco & San Jose Rail Map can be loaded in the › City Rail Map app.